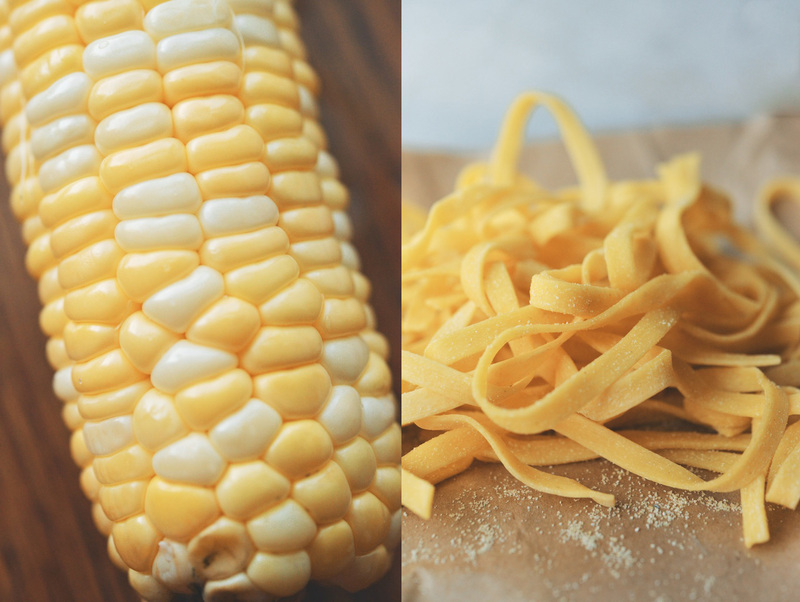 This pasta is my little swan-song to the end of summer. It contains everything I’ve cooked like crazy this season: slow roasted tomatoes by the armful, sweet corn, and fresh cheese. It’s balanced, tasty, and simple. I made this with (store bought) basil pesto (hey, the Frenchman is away on business this week, so I’m keeping dinner as effortless as possible), but you can use arugula, or really whatever kind of pesto you’re into. 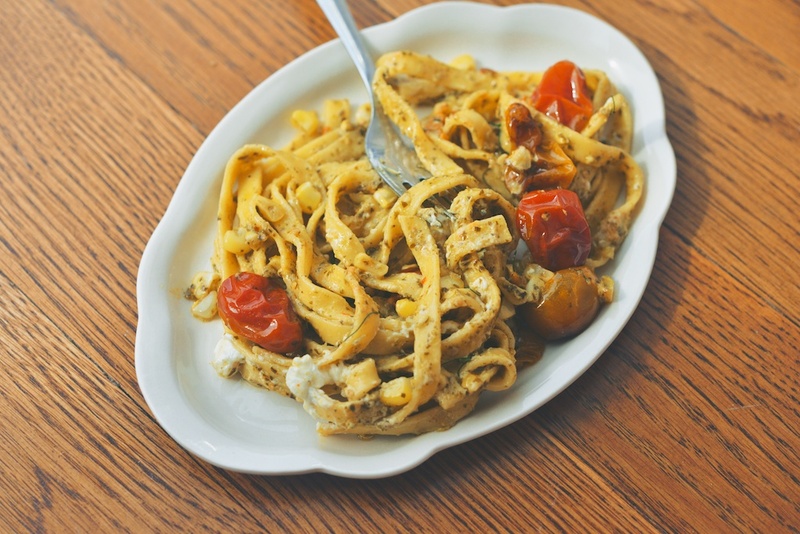 Also, the butter is not mandatory, but it helps to bind the sauce together, and pushes the tagliatelle in the direction of a restaurant-rich pasta dish. I think the taste of toasty hazelnuts complements the dish, but if you prefer, you can substitute breadcrumbs–the point is to give the pasta a little crunch for textural diversity. 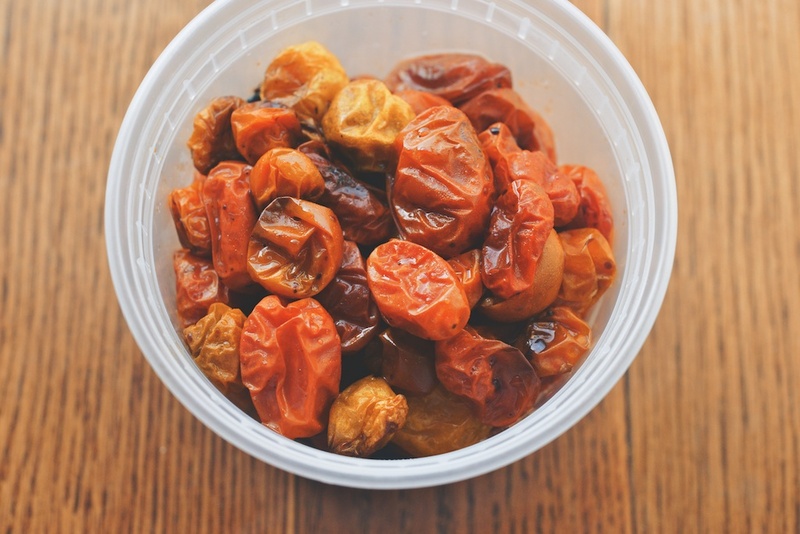 My suggestion is to roast the tomatoes the night before. They need so little attention, it’s no hardship to forget them in the oven once you get home from work. Pour yourself a cocktail, or give your kid a bath. Before The Daily Show comes on, the tomatoes will be done–flavor concentrated and ready to burst. 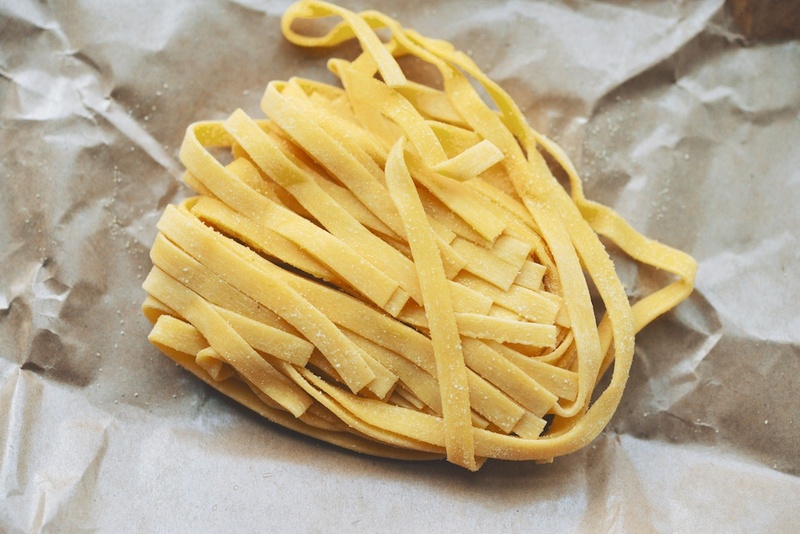 If you don’t have access to fresh pasta, you can use dried; you’ll just have to boil it longer than the fresh stuff. You may think that a quarter pound of pasta doesn’t seem like enough for two people; well, they aren’t very large portions. 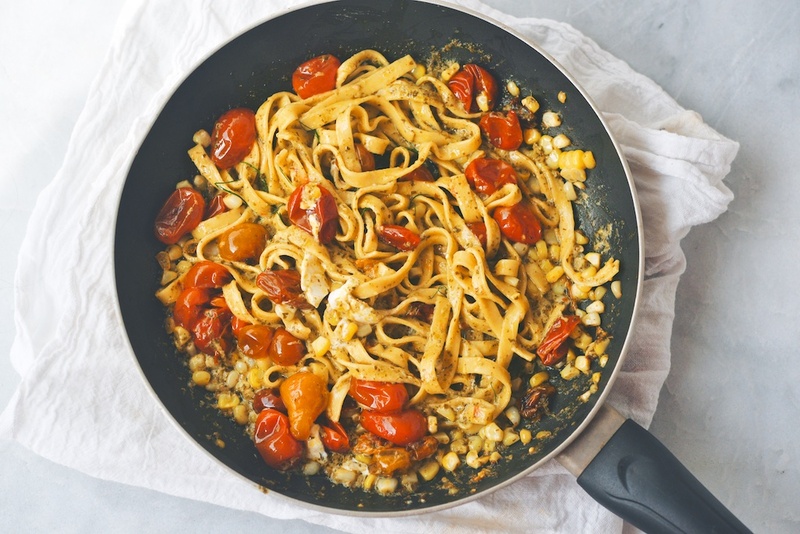 Also, late summer tomatoes and corn get equal billing in this dish. 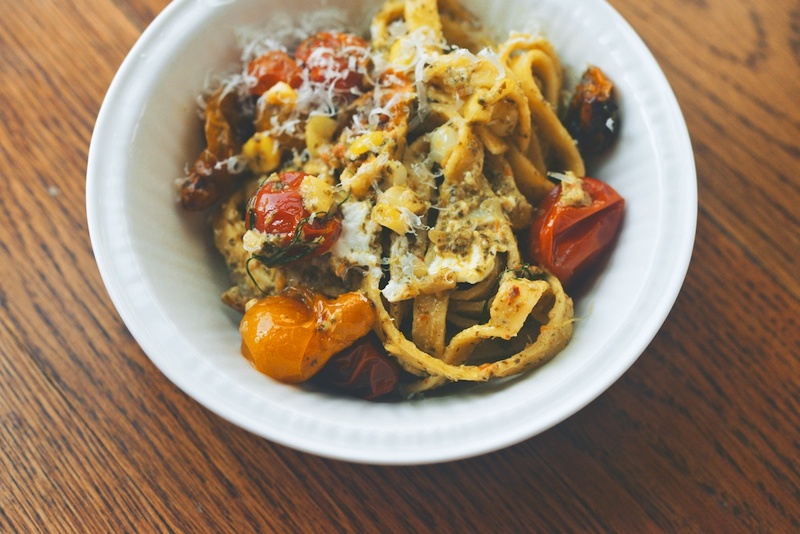 Add pesto and fresh goat cheese to the equation, and you’ll be happy not to have more pasta on your plate. 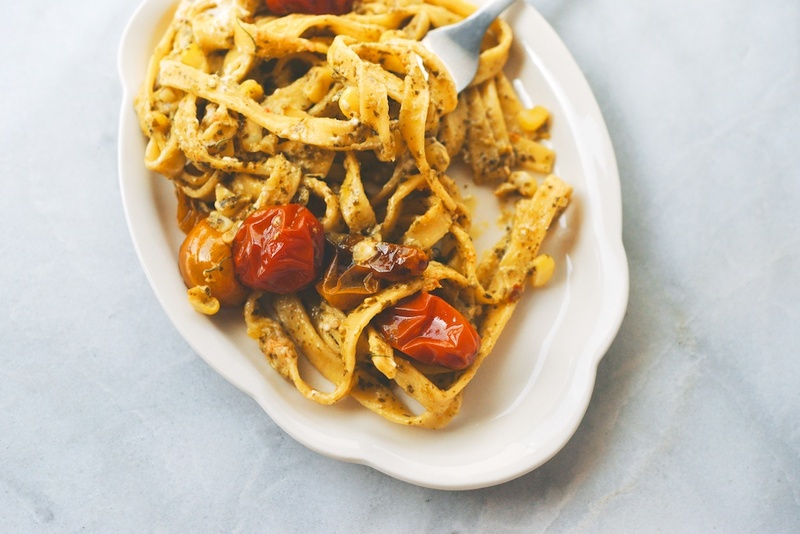 This is a flavorful, last of summer celebration pasta, in a non-coma inducing quantity. Any extra tomatoes should be served on buttered or ricotta-ed toast. Makes 2 bowlfuls. Heat the oven to 250F. Set a medium pot of water on the range, and turn the heat to high. Allow the water to come to a rolling boil. Shuck the corn. When the water is boiling add the corn; cook for about 4 minutes. Remove the cob from the water and, when it’s cool enough to handle, cut away the kernels; set the corn aside. Add new water to the pot, along with quite a lot of kosher salt, until it tastes like the sea. Set the heat to high, and wait for the water to once again reach a boil. Meanwhile, crush the hazelnuts–I moved them to a plastic bag, and whacked them with a mallet. Set the hazelnuts aside. Melt the butter in a pan over medium-low heat. Add the tomatoes and corn kernels to the pan. When the water reaches a boil, add the tagliatelle. Cook it for about 2-3 minutes, or until the pasta rises to the top of the water. Using tongs, transfer the pasta directly to the saucepan, along with about 1/4 cup of the pasta cooking water. Increase the heat under the pan to medium. Stir in the goat cheese, the red pepper flakes, the pesto, the crushed hazelnuts, and grated Parmesan (however much you like). Use the tongs to toss the pasta and the sauce together. Add a little more pasta water, if it looks too dry. 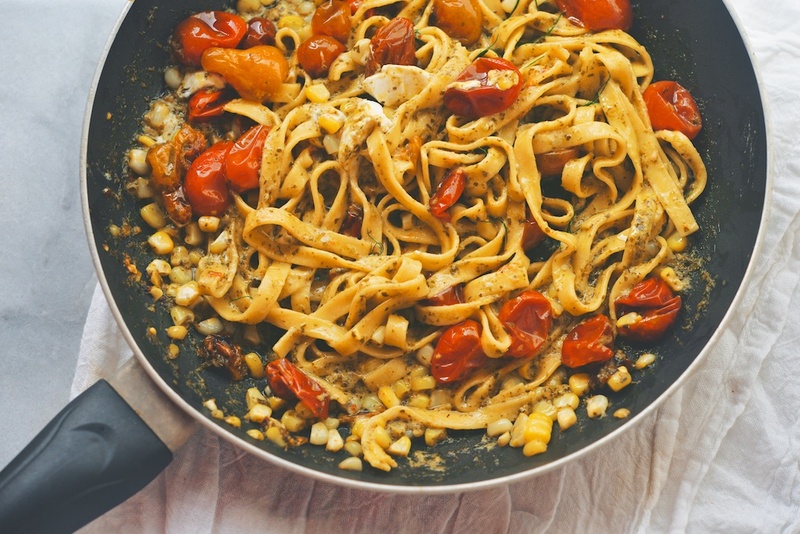 Cook the tagliatelle in the pan for another 1-2 minutes. Divide the pasta between two bowls. Enjoy hot. Was looking all over the internet for a great simple pasta recipe for lunch. This is the definite winner.. my tastebuds are tingling! Looks delicious. 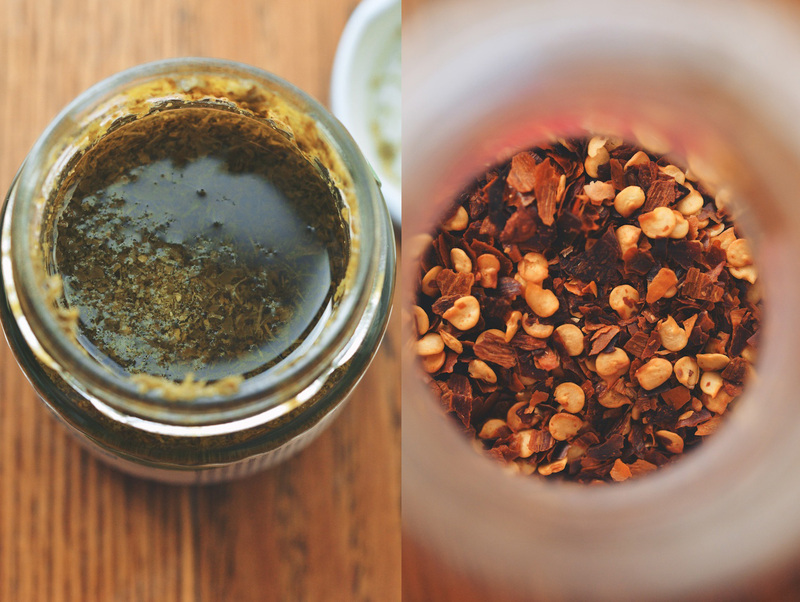 Do you just toss the hazelnuts in when you add the goat cheese and red pepper flakes? Thanks, Meghan, you’re right–add it along with the goat cheese. I’ve updated the recipe!